Water is an essential element for survival of life on earth. The human body requires 2 to 3 litres of water everyday to keep it free from harmful toxins. In this fast paced modern lifestyle, water contamination has become common and industrial pollution adds to the problem. The ideal environment in which germs breed is thus created. Through drinking water germs enter the human body which becomes the breeding ground for diseases that slowly and steadily destroy life. It is however important that the water we drink is free from impurities like gastroenteritis, typhoid, cholera, dysentery, jaundice, etc. Various purification processes are followed to make water potable like boiling &ionization. Is bottled water the answer? 11 out of 16 bottled water samples tested did not pass the ISI test for potable drinking water. YES, UV purifier is the only solution for such water problem. The Ultra Violet (UV) wavelength of 253.7nm has the greatest germicidal property, which penetrates cell membranes of bacteria/viruses to destroy DNA which is responsible for functioning of microorganisms. There are no known microorganism resistant to UV. 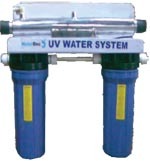 Therefore UV provides an efficient bacteria disinfection in water. It does not leave any residual tastes in treated water. 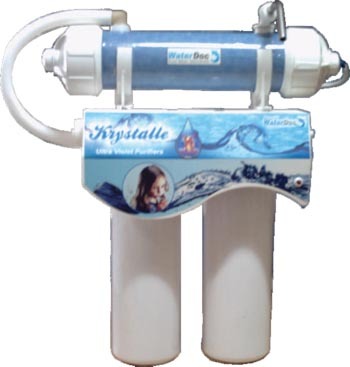 An UV water purification system is preferred worldwide, because it is the simplest and the most practical method of destroying microorganisms in water with minimum contact time, minimum cost and minimum maintenance. 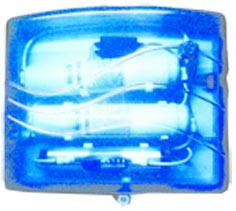 UV Purifier for low pressure of water specially for loft tanks in residential areas. The premium model in UV Purifier with PPS (Permanent Purity Switch), fully automatic.